cities in the country, this is truer than ever. 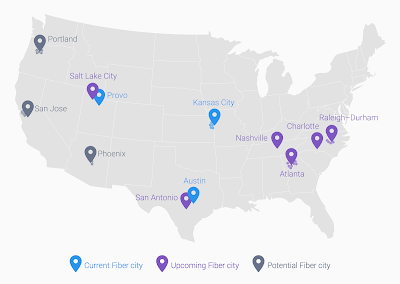 Which is why, today, we’re proud to announce that Google Fiber is coming to San Antonio—the largest Fiber city to date. From starting Bexar BiblioTech, the first all-digital public library in the U.S., to being named a leading city in cybersecurity, San Antonio has developed a thriving tech landscape. Hundreds of startups have found their home in the Alamo City through collaborative workspaces and accelerators like Geekdom and Cafe Commerce. Moreover, San Antonio’s recent selection for President Obama’s Tech Hire and Connect Home initiatives will help create a pipeline of tech jobs and narrow the digital divide. With speeds up to 1,000Mbps, compared to the U.S. average of just 12Mbps (Akamai, Q1 2015), Google Fiber will further fuel the city’s growth. Kansas City, Provo, and fellow Texas tech-hub Austin have already shown what’s possible when growing cities and businesses have access to gigabit internet. In the homes of those using Google Fiber, families spend less time arguing over bandwidth, and more time surfing the web. In Kansas City, small businesses like Propaganda3 use Google Fiber to develop more software faster, while others like Midtown Signs use it to upload large files in a flash. As Google Fiber begins to help individuals, families, and businesses work toward their goals in San Antonio, we will have more stories that reflect this city’s unique character. For information about Google Fiber’s progress in your area, visit our website and join our mailing list for updates. Fast growing cities need Internet speeds that can keep up with their progress. For the 1.4 million residents of San Antonio, one of the biggest and fastest growing cities in the country, this is truer than ever. 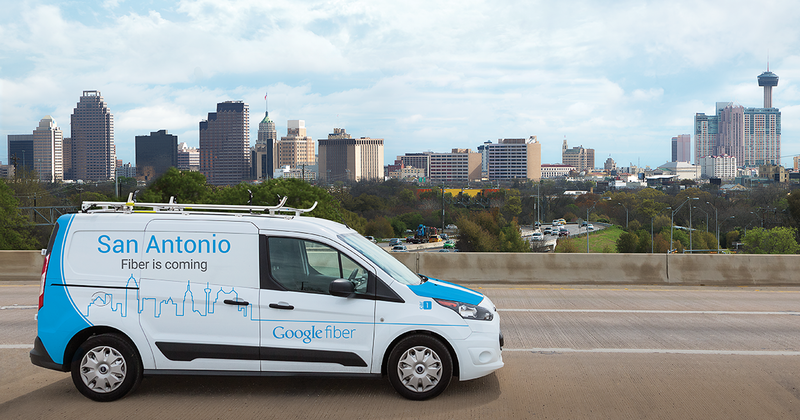 Which is why, today, we’re proud to announce that Google Fiber is coming to San Antonio—the largest Fiber city to date.